Ocean View is a stunning 5 bedroom house set just outside Port Charlotte in the hamlet of Nerabus. 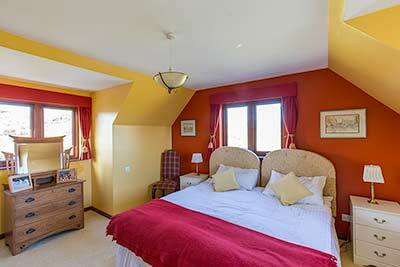 It is furnished with large bedrooms with ensuite bathrooms. A full Scottish breakfast is provided for you each morning. There is plenty of parking and other facilities such as restaurants and a shop are situated in the village 2 miles away. It boasts magnificent views across to Antrim in Ireland and The Oa and Lochindaal on Islay. Surrounded by wildlife, it is a regular occurrence to see Red Deer in the garden, Barnacle Geese, birds of prey, rare choughs and hen harriers. The proprietors, Audrey and John Gow bought Ocean View from Audrey’s parents in 2016 who had also ran the house as a 5 star bed and breakfast and are now retired. Audrey and John are also joined by their dog and 4 children who come home regularly. The island has many beautiful walks and beaches plus 8 distilleries soon to be 9 spread across the whole island. You can also easily access the island of Jura from Islay as there is a regular daily ferry.